The SUEWS Analyzer plugin can be used to make basic analysis of model results generated by the SUEWS Simple and SUEWS Advanced plugins. top Model results to be analyzer is specified. A namelist (RunControl.nml) used for the model run should be specified. This can be located in the suewsmodel directory found as a sub-directory of the UMEP-plugin directory. Note that the namelist includes information on the last model run performed. Grid Here, a list of all available modeled grids are listed. Specify one of the grid IDs. If no grid is available, then no data if found in the model output folder. Year to investigate Specify one of the available years to plot. Plot basic data Tick this in to plot a summary of the most essential output variables. Time Period (DOY) Specify the time period to plot. Variable Specify one of the available variables to plot. Include another variable Tick this in to add another variable in the plot. Scatterplot Tick this in to generate a scatterplot between the two variables specified above. Variable to analyze Select a listed variable to process. If no variable is available, then no data if found in the Model output folder. Average Tick this in to derive a grid-wise average. Maximum Tick this in to derive a grid-wise maximum. Minimum Tick this in to derive a grid-wise minimum. Median Tick this in to derive a grid-wise median value. IQR Tick this in to derive a grid-wise interquartile range. Diurnal Tick this in to include diurnal (all) data. Daytime Tick this in to include daytime data. Nightime Tick this in to include nighttime data. 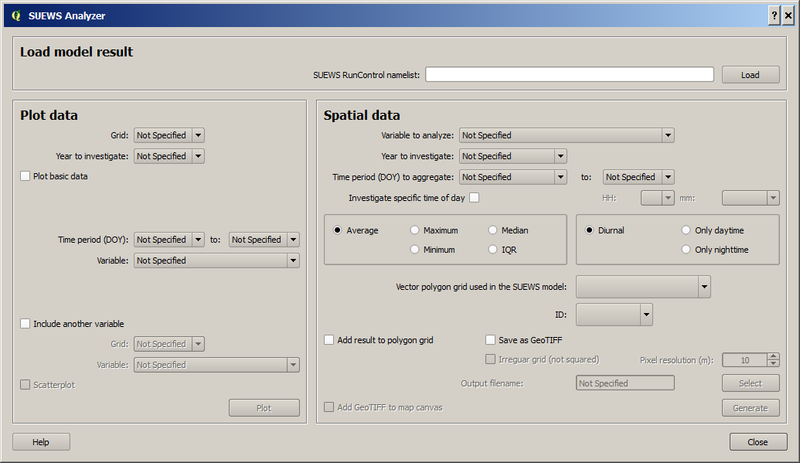 Vector polygon grid used in the SUEWS model Specify the grid that was used to generate the input data to the SUEWS model run of interest. ID Specify the attribute ID used to generate the input data to the SUEWS model run of interest. Add result to polygon grid Tick this box to add the results in the attribute table of the grid specified. Save of GeoTIFF Tick this in to generate a raster grid from the analyze settings specified. Irregular grid (not squared) Tick this in if a grid is irregular i.e. not squared and aligned north to south. Pixel resolution (m) When a irregular grid is used, a pixel resolution in meters must be specified. Output filename Name of the GeoTIFF to be saved. Add analysis to map canvas All analysis specified above will be added to the map canvas if this box is ticked in. Generate Starts the spatial processing/analysis.